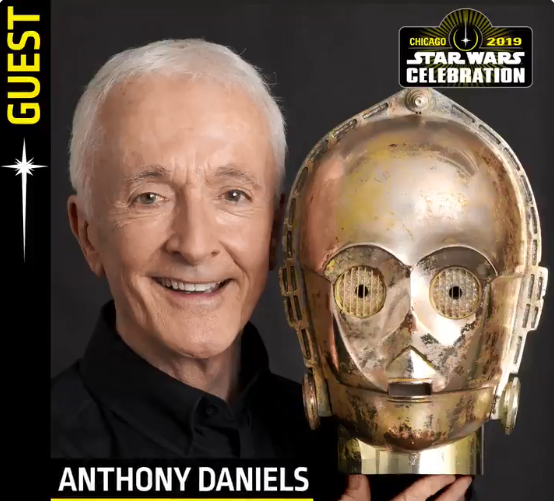 Star Wars Celebration: Anthony Daniels Finally Admits He’s Going – and Panel Dates, Times, and Guests for ‘Resistance’ and ‘The Clone Wars’ Revealed! We are 10 days away from Star Wars Celebration 2019 and more guest and panel updates have come out over the past few days via the official Celebration social media accounts, including Anthony Daniels finally admitting he is attending the event after months of famously-cryptic tweeting! The dates, times, and guests for panels on Star Wars Resistance and The Clone Wars have been revealed as well! Anthony Daniels will be attending Celebration and holding private meet and greet opportunities for fans of the professor, as Han Solo once called him. Daniels is the only actor to appear in every Star Wars movie to date. The panel for Star Wars Resistance will take place on Monday, April 15th at 1:30PM CST on the Galaxy Stage, one of the final panels of the five-day event! The panel will include cast members Christopher Sean, Suzie McGrath, Donald Faison, Scott Lawrence, Myrna Velasco, and more! Unfortunately our friend and legendary Star Wars voice actor Stephen Stanton will not be one of the cast members attending, due to prior professional commitments. Lore-master Dave Filoni will hold the panel for the revival of The Clone Wars on Sunday, April 14th at 3:30PM CST on the Celebration Stage, offering a sneak peek of the final season of the series. I wonder if it will be a full episode! We’ll see in less than two weeks! We will keep you posted as the final guests and event details are revealed. If you are going, be sure to come see the SWNN team as we’ll be covering the event all five days, setting up impromptu meet ups with giveaways, and The Resistance Broadcast is podcasting on the podcast stage on Saturday 4/13 at 6pm followed by a hangout after! If you are not attending the event, fear not, as the Star Wars YouTube channel will be streaming the big panels. We will be doing full analysis, reactions, and breakdowns to everything throughout the weekend right here on the site and on our YouTube channel so be sure to subscribe stick with us throughout the weekend for all of the details and coverage/reactions from the event! It is an exciting time to be a Star Wars fan, and Celebration will launch things into hyperspace soon!